Valhalla, one of the Brazil’s oldest (and probably, earliest) female fronted death metal combos, has a checkered history with only sporadic output due to nearly constant personnel problems. The band formed in Brazil in 1988 as Adrea, and was briefly called Phobia, before adopting its current moniker for obvious reasons. Fixtures in all of the band’s various incarnations are the Tavares siblings Adriana, and Alessandra. “Evil Fills Me” is the vocal debut for Ariadne Souza, who has held the drum position since 2005. It has everything you’d expect from a band with nearly three decades experience behind its belt. If this is any indication of the future Valhalla might just surprise the world soon. Given its long history it doesn’t come as a surprise that Valhalla draws inspiration from a liege of older American genre pillars. The trio sounds as a mix of various Tampa, Florida death metal luminaries, chief among them Monstrosity (“Imperial Doom”) and to a lesser degree Death (“Leprosy”, “Spiritual Healing”). “Evil Fills Me” has the combative thrashiness of Malevolent Creation, and the bass-heavy murkiness of Deicide’s crass self-titled debut. Unlike a lot of the genre’s younger practitioners Valhalla captures the genre’s hateful and macabre atmosphere that was prevalent during the 90s. In a sense they are remininscent of long suffering US death metal pillar Sadistic Intent that way. 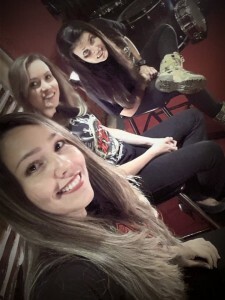 In its current form Valhalla consists of sibling guitar tandem Adriana and Alessandra Tavares (who also plays bass guitar), and newly minted vocalist/drummer Ariadne Souza. Despite the fact that the band has been around for nearly a quarter century its knowledge of the English language still appears to be rudimentary at best. Thankfully the trio’s musical chops leave nothing to be desired. Both Tavares siblings deliver excellent riffs and chord progressions, but the true star of the record is Ariadne Souza who pulls double duty as both drummer and vocalist. Souza refrains from blasting excessively and her style is reminiscent of Steve Asheim’s work on “Legion” and “Once Upon the Cross”. Souza’s work behind the kit is compositionally stronger than the tiresome blasting that has sadly become the standard in the genre. Regardless she isn’t going to be named as the Brazilian successor to Lee Harrison anytime soon. She is however technically more accomplished than, say, Fernanda Terra or the likes. The trio harnesses the earthen grittiness, oppressive atmosphere and ominous gloom that a lot of the established US death metal institutions (minus Incantation, possibly) have lost over the years. While hardly technical by any stretch of the imagination Valhalla writes to its strength without necessarily pushing the genre’s envelope. It goes almost without saying that “Evil Fills Me” is so powerful because of its consistency and genre purity. Valhalla plays death metal without any prefixes, or pretense. In that sense they are akin to UK warmongers Bolt Thrower. ‘Internal War’ houses a few impressive drum patterns and evil sounding riff schemes. ‘Mystery Of Existence’ recalls the Monstrosity song ‘The Exordium’ in its main riff. ‘Weird Desire’ sounds like “Imperial Doom” era Monstrosity, whereas the title track ramps up the vintage Deicide riffing. Souza has a monstrous grunt that combines the ferocity of George Fisher (Cannibal Corpse, ex-Monstrosity) and Glen Benton (Deicide, Vital Remains) in his younger years. “Evil Fills Me” was recorded with Guilherme Peixoto producing at his home studio. His work behind the console is very much in the 90s tradition. The production on “Evil Fills Me” sounds as if it came directly from the Morrisound Studios assembly line during the studio’s profilic 90s era. The production is crunchy with its gritty, murky tones and it adds a sense of gloom that is lost on younger acts in the genre. The bass guitar lies prominently in the mix without ever doing anything that warrants attention. The drum tone is warm and organic sounding. The entire production exudes the type warmth that was commonplace during the 1990s. Admittedly it is a bit rough around the edges, but “Evil Fills Me” is never underproduced. The impressive digital artwork by Rubens Snitram for Azoth Design fits the record perfectly in its abstract macabreness. The EP was originally released independently. It was later picked up by British label imprint Secret Service Records for wider European distribution. One of Valhalla’s biggest strengths is its sense of tradition, and genre purity. Younger practitioners of the genre, such as the lauded Cauterization and Necromesis, too are bereft of any contemporary conventions. That isn’t to say that Valhalla is a relic of the 1990s. Far from it. It stands to reason that Valhalla is just doing what it always has done. There is nothing very ornamental about the band’s music, and that’s exactly the point with this genre. 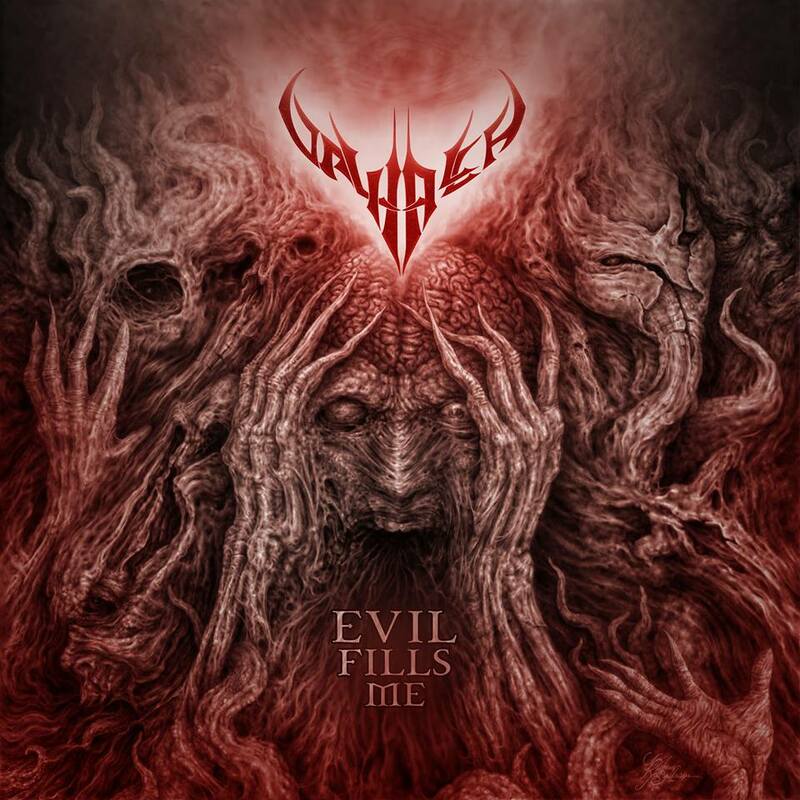 “Evil Fills Me” sounds like a long lost early Malevolent Creation or Monstrosity record. Valhalla isn’t concerned with playing the fastest, or being the most technical. Like vintage Sadistic Intent the ladies only care about writing the darkest, most hateful sounding death metal they are capable of – and they succeeded with flying colors. Hopefully we’ll see Valhalla return with a full-length effort sooner rather than later.